Borneo’s three-day jungle music fiesta is worth the effort it takes to get there! 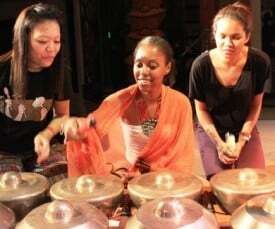 Performers from six continents gathered in the Borneo jungle last weekend for the 16th annual Rainforest Music Festival, a three-day, global song and dance celebration. The festival takes place each year at the Sarawak Cultural Village, an open-air folk museum an hour outside of Kuching, Malaysia. Amid a backdrop of towering trees and bamboo bridges, crowds danced and partied to a sprawling array of concerts and workshops. In quieter moments, we could hear frogs ribbiting to the music. 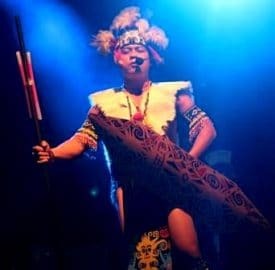 The concerts kicked off Friday night with ritual blessings from four Sarawak tribes. Clad in ceremonial clothing, headdresses, and body paints, tribal representatives chanted and yelped prayers to the spirits they believe inhabit the surrounding jungle. The blessings, according to a storyteller at the venue, were requests to the spirits to not do any harm during the performance. 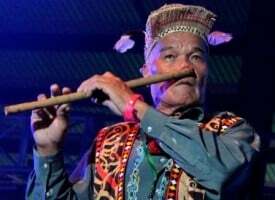 71-year-old Juk Wan Emang rocks out on the Sarawak nose flute, an instrument traditionally used by Borneo’s Kayan people in courtship rituals. Following the opening blessings, 71-year-old Juk Wan Emang, one of the few living masters of the Sarawak nose flute, played a short set, followed by Rhythm in Bronze, a group that plays contemporary compositions on the gamelan, a set of percussion instruments that originated in Indonesia. From there, the show took on a global flare. Chet Nuneta from France belted out their own style of southern and eastern European music. Rey Vallaneto Beto Jamaica fired up the crowd with high-energy, accordion-fueled, fiesta tunes from Colombia. Alp Bora, a modern Turkish folk group based in Austria, played songs from throughout the Balkans. Rounding out the evening were the Australian Aboriginal dance group Nunukul Yuggera, and Kila, a band from Ireland that puts a modern spin on traditional Celtic music. South Africa’s Dizu Plaatjies and the Ibuyambo Ensemble paid homage to Nelson Mandela. Saturday and Sunday nights, the diversity continued with, among other acts, a Louisiana Cajun band, South African pop music, Danish drinking songs, and Iranian bagpipes. For the quality of music, not to mention the sheer variety, the festival lived up to its recent recognition in Songlines Magazine’s list of 25 of the best international festivals. Equally impressive was how seamlessly everything went off. In an afternoon workshop, the gamelan group, Rhythm in Brass, invited festival-goers to try out their instruments. Transporting hundreds of musicians, instruments, equipment, and two elaborate stages into the rainforest, and setting up a venue to handle several thousand attendees, is not easy – yet the acoustics were fantastic, the light shows meshed with the natural surroundings, and the production seemed to flow effortlessly from one act into the next. Alternating acts toggled between two adjacent stages so there was never any waiting. As soon as one band finished, an emcee was ready to lead into the next performance on the other stage. And that’s just what went down during the nighttime concerts. Each afternoon, festival-goers could choose between three different workshops in each of three time slots. The “Blowpipes in Borneo?” workshop featured wind instruments from around the world. Some workshops demonstrated disparate instruments with related methods of playing. The “Blowpipes in Borneo” presentation, for example, brought together a trombone, a trumpet, a didgeridoo, and four different types of bagpipes from different parts of the world. Each musician demonstrated his instrument individually. Then, they all jammed together. (It was loud.) Other sessions focused on regional storytelling or invited group participation in interactive dance workshops. I stumbled onto the Rainforest World Music Festival by accident. I happened to be traveling in Borneo already, but I hadn’t planned to attend because it didn’t fit with my other travel plans. In the three weeks leading up to the weekend, however, person after person I met told me I needed to be there. I’m glad they did. I rearranged my schedule so I could go on two of the three nights. Now that I know what I almost missed, I’ll be making a big effort to go back for all three nights in the future. 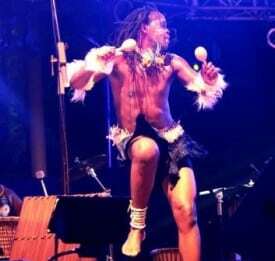 2014 Rainforest World Music Festival: Wanna Go? Tickets to the 2013 festival cost 120 ringgit per day, or 300 for a three-day pass. Kuching is a big city with plenty of hotels and hostels in a wide range of price categories. Alternatively, accommodations ranging from budget, dorm-style cabins to upscale resorts, are available within walking distance of the cultural village. For the 2013 festival, I stayed in downtown Kuching, though I would recommend staying out at the venue if you plan to attend more than one day. For the most current details on future gatherings, the Rainforest World Music Festival website is at rwmf.net. Thanks to the festival organizers and media center, the Sarawak Ministry of Tourism, the Grand Margherita Hotel in Kuching, and Tom and Katie at El Centro Café in Kota Kinabalu, for their assistance with this article.